Accessibird is an art project that uses the land, specifically birds, to help us understand our relationship to accessibility. The birds give the project humour and honesty to a subject that is easy to overlook. I’ve made wooden and paper signs that will be placed across the festival grounds, drawing attention to aspects of the festival that are inaccessible for some folks. Accessibility is a really big word. There are so many aspects and factors that are a part of it. I hope Accessibird makes people aware of this as well as encourages them to ask questions about their own interactions with accessibility. In this project I hope to lift up the voices and experiences of others. While I have accessibility needs that are often not met, I’m also still able to show up to most spaces I want to. A lot of able bodied people get to move about in their lives without much interaction with disability. A lack of accessibility separates the able bodied from the disabled. When do you interact with disabled people? How are your life and actions inviting them to exist? I learned a lot while working on Accessibird and I hope it gives you the opportunity to learn too. Image description: Photo of two small wooden signs leaned against a chair. 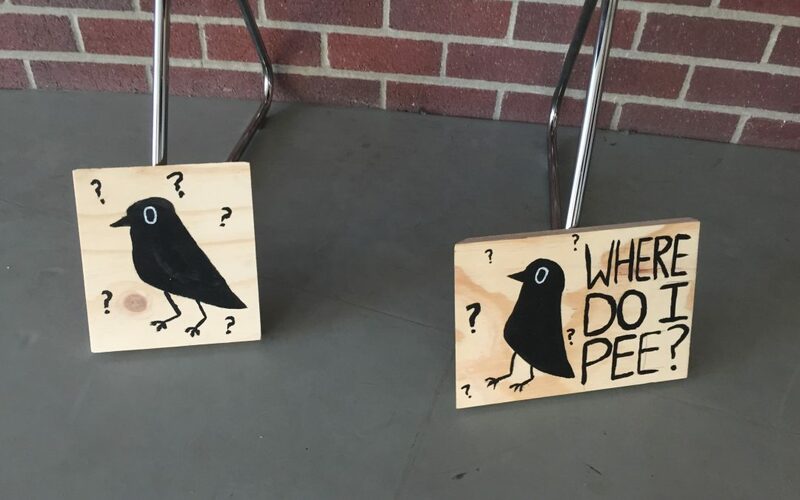 Each sign shows a black painted confused crow and one sign says “Where do I pee?”.